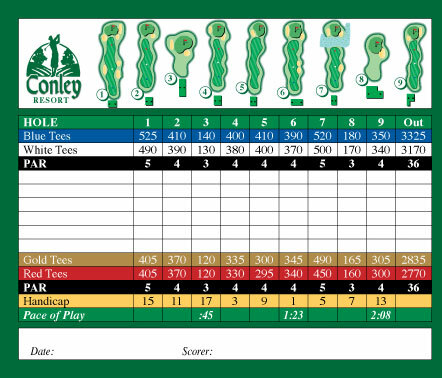 An oasis for the serious golfer, Conley Resort has everything you need for a day on the course or perfect weekend golf getaway. Experience our country setting surrounded by rolling hills and serene lakes as you play the round of your dreams. If more than a round is what you desire, let our professional staff schedule an extended golf getaway for you and your group. We have packages that will meet the needs of large and small groups. Call 724-586-7711 for details. This 490 Yard Par 5 is a great starting hole. A drive left or center in the fairway is the perfect shot, avoiding the fairway bunkers to the right. Your shot to the green should be played more right, shots short of the green tend to fall off left. Green is relatively flat and true. Teeing with a blind spot, your drive should favor the left side. The shot into the green can be a challenge, it is protected by two large pines trees located on both the left and right sides. Green has a slight back to front slope. This par 3 may be the shortest hole on the course, but trust the yardage makers on the tee. You will need to have enough club to clear a bunker which guards the front of the green (and watch out for the deep bunker to the left below the green). Putting this green should be played with a right to left slope. Not a very friendly hole, you need to have your “A” game here. With a straight shot up the middle and over the hill you should be safe. Left or right you’re in the trees and may not have a clear shot to the green. (Left side of the fairway falls hard to the left). The green is the best thing about this hole, it is flat and true. Your tee shot should be straight using the fairway directional flag to guide you. Avoid the trees on the left side of the fairway. The approach shot to the green will more than likely have a down hill lie, use less club to avoid flying the green. The green is large and you could very easily end up with a 50 foot putt if you’re not close to the pin. Watch for the slight left to right slope, it may cost you a stroke. You’ll have a slight dog left right to contend with on this tee shot. A shot up the middle is the safest bet. Your shot into the green should be at the pin, anything left or right will fall off. This is another large green with a back to front slope, you’ll need to have that perfect touch here. This is our risk reward hole… A bogie is just as easy to achieve as a birdie here. Tee Shot should be straight up the middle for the best position, avoid the trees to the left. The green is protected by a wetland area, so the true test is whether to go for it up or lay it up. The green is relatively flat on the upper half, but watch out, the front will fall off quickly toward the wetland. This hole can be considered a true test to your golf game. Trees to the left a bunker to the right make your choices limited, a shot to the center of this green is your only option. 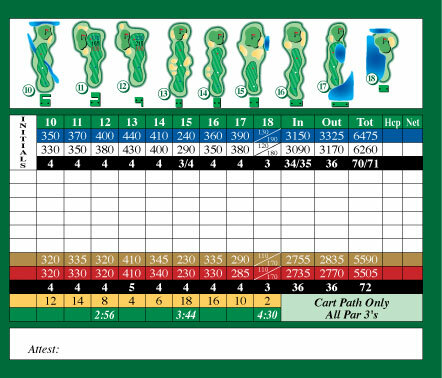 The green has several different levels and can be tricky to putt. Your tee shot needs to follow the dog left up hill to find the best placement. You’ll have an easy second shot to the elevated green, but choose your club wisley… A long shot could spell trouble, this is a tough green to hold. This green, though flat, may have some hidden breaks you’ll need to look for. The perfect tee shot for this hole would be approximately 200 yards, this will avoid the two huge oak trees on the right. The shot to the green should be at the pin, long will put you below the green and possibly into the creek. This is a small green that is very flat, except in the front. 190 degree dog left, you need to place your tee shot at the top of the hill (approximately 165 yards) in the center of the dog leg. This will leave you with a short iron shot to the green. It is imperative to hit the green on this shot, if you leave it short it may roll off the back. A very tricky green with multiple breaks, watch your touch here. If you didn’t like #11, you’re really going to hate # 12! This is another 90 degree dog left. Your safest shot is straight up the middle (approximately 210 yards) with a small landing area. Your second is a straight 130 yard shot to land on a long narrow green which falls away from you with a gradual slope from left to right. If you saved your straightest drive for this hole, you made the right decision. This will place you safely in between the six fairway bunkers. Though it may seem you are out of danger, there are two more bunkers protecting the front of this green. If you don’t think your second shot will reach the green, it’s best to play your lay up to the left. There is nothing special about this green, just get it to the hole. Swing away! It’s straight up the chute… With a long way to go. Your second shot will be into an elevated green with a bunker and trees to the left and a steep slope to the right. Your putt should roll true on this green. With a big drive on this short part 4, you could be putting for two. But with trouble surrounding this green you could just as well end up with a bogie. Watch the bunkers in front and the small pond to the right of the approach. A multilevel green which could add strokes if our Superintendent is in a foul mood. You’ll need to hold your breath when putting this green. A slight dog left off the tee will put you in a good position to hit this large green. It’s an easy target, so don’t over shoot it. This green rolls true and shouldn’t give you much trouble to score well. You’ll need to clear the water in front of this tee for a decent second shot setup. You may want to play this a little left because your water woes aren’t over yet. Watch the pond that borders the right side of the fairway on the way to the green. A slight elevation to this green and the fact that it is a bit smaller, may add some skill testing to your game. Once you’re on the green a true out may be evident, but look for a small break from left to right. This is our signature hole… And may make or break your game! This par 3 green is protected on all sides by trees and a bunker to the right and water at the front and back. The only safe shot is to hit the green. This green breaks to the water, so a soft touch might be a good decision.